So what are the challenges facing merchants in Town Square? According to Dawson’s owner Rick Hood, “the store did not generate enough business to be financially viable.” In a nutshell, that means expenses exceeded revenue–issues that are not being considered in the current discussions about Town Square. Let’s look first at expenses. For any Town Center merchant, the expenses include payroll and inventory, but also the rent. FRIT is correct in saying that rent and lease expenses include “many variables” and are always negotiated on an individual basis to find a mutually beneficial deal (e.g., Dawson’s received several dedicated parking spaces and naming rights to the stage, other stores didn’t) but some “variables” are difficult to escape, such as property taxes. Rockville Town Square has the highest property tax rate in Montgomery County, a cost that is usually passed onto the businesses (statewide comparison of tax rates available at the Maryland Department of Assessments and Taxation). If a business is located outside of Town Center (just across the street, for example), expenses are significantly less. Should the Mayor and Council reduce the property tax rates to make them align with the rest of Rockville? Perhaps, but that will be a tough pill to swallow because it’s tied to the three Town Square parking garages. In 2006 (or thereabouts), the Mayor and Council made a devil’s bargain to borrow $35 million to construct the three garages, a debt payment that remains with us all until 2036. Those dreaded parking fees pay to maintain and repair the garages, not the debt, and most likely will stay with us for years to come. The other consequence is that free parking disappeared downtown to encourage people to use the Town Square garages to maintain the traffic that’s used to pay for the debt, maintenance, and repair of Town Square. It’s a snake swallowing its tail —and we’re the snake. This isn’t just a “downtown problem” that can be ignored by King Farm, Twinbrook, or folks west of 270. We’re all paying for that $35 million debt and if Town Square fails, we’ll have to pay off the money due on those garages in other ways, such as higher property taxes or fees from new development. Secondly, let’s look at revenue. While grocery stores have lots of regular repeat customers (unlike an appliance store), they have very thin profit margins because much of their inventory is perishable, labor costs are high and escalating, and there’s lots of competition. To attract more customers, grocery stores have increased their inventory and offerings dramatically, which usually means much larger stores. Developer B. F. Saul has just signed a lease with Wegman’s for its Twinbrook Metro project and it’s expected to be more than 100,000 square feet in size. At 19,000 square feet (not all of it fully used), Dawson’s was dwarfed by today’s grocery stores, which are usually four-five times larger. To compete, smaller grocery stores specialize to distinguish themselves from the big grocery stores, resulting in a plethora of ethnic markets around Rockville. Dawson’s attempted to compete by focusing on sustainable, organic, and gourmet products but it wasn’t sufficient. The big question for Town Square is what will succeed in the space that a grocery store has abandoned after six years and laid empty for five years prior? The usual cries for another grocery store or hardware store are inadequate–we have to look at it from a business perspective. 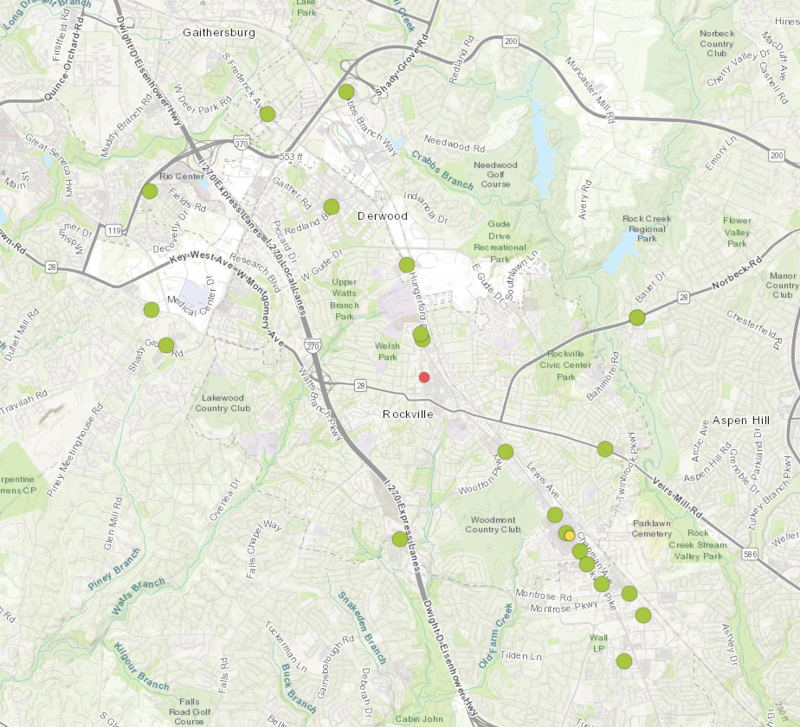 The first issue is identifying the existing competition by looking at a map of Rockville, you’ll see the major grocery stores are located in a distinct pattern: they’re few and far between north of Rockville, tight and clustered south of Rockville, and rare on the east or west. If you selectively connect the dots, you might see a funnel-like shape (wide at the top, narrow at the bottom). Map of major grocery stores in Rockville (2018). Green are existing stores, red the recently closed Dawson’s Market, and yellow the proposed Wegman’s. How did this occur? First, the Planning Commission limited the zones where major grocery stores (more than 50,000 square feet with parking) can be located. There’s just no place to put one in Fallsmead, Horizon Hill, New Mark Commons, East Rockville, or Lincoln Park—or downtown. Second, it’s about fishing where the fish are. Within a mile of the proposed Wegman’s (yellow dot on map) live more than 25,000 residents; by comparison, Dawson’s (red dot on map) had 17,000—that’s nearly a 40 percent difference. And Wegman’s can look forward to more customers due to the number of housing projects underway around the Twinbrook Metro station; Town Center can’t because of the restrictions on and neighborhood opposition to development downtown. This is a complex issue with many interconnected parts. The Mayor and Council will be faced with this issue in the 2019 but it’ll be a mess. Because it’s an election year, I suspect they’ll be lulled into simplistic, short-sighted answers that will please the most vocal voters and their ardent supporters (who often have narrow neighborhood-only interests and work from limited information). It also means they’ll ignore the experts on city staff (their answers are too complicated and solutions too difficult) and the voices of business owners (because they don’t vote). The best solution will most likely consist of a package of solutions to address myriad issues at the same time but that will be difficult to concoct under the current Mayor and Council (they’re having a hard enough time hiring and keeping a City Clerk). Indeed, the lack of a viable vision for downtown goes back to the 1960s, when the Mayor and Council chose to redevelop downtown by calling it blighted and demolishing forty acres from edge to edge. The American Planning Association gave Rockville and New Haven, Connecticut, an award for their efforts but both cities are now largely regarded as examples of how-not-to-do-city-planning. The indoor shopping mall that replaced downtown failed within a decade and was also demolished, leaving an empty parking lot that is only recently being developed. An incredibly sad story for downtown that’s had negative consequences for generations, and despite the in-your-face consequences of demolition, redevelopment through demolition is still the approach favored by the Mayor and Council (a recent example include the Suburban Trust Building on North Washington and the IBM Building on Monroe). Instead, I recommend the long-studied and well-regarded approach to rehabilitate and reuse older buildings, adding common amenities (such as landscaping, restrooms, fountains, parking lots, bike racks, walking trails), and using demolition selectively and as a last resort. Consider it the ultimate form of recycling. Ironically, the Rockville Mayor that encouraged redevelopment in the 1960s soon afterwards moved to Annapolis, a town nationally recognized for preserving its historic downtown. To learn more, see Main Street America and the Project for Public Spaces. For some glimpses of what was lost due to redevelopment, here are a few photos of downtown Rockville taken on the eve of its demolition.